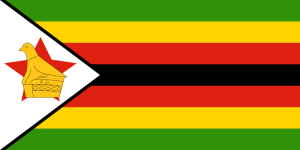 Zimbabwe (/zɪmˈbɑːbweɪ/), officially the Republic of Zimbabwe, is a landlocked sovereign state located in southern Africa, between the Zambezi and Limpopo Rivers. It borders South Africa to the south, Botswana to the west and southwest, Zambia to the northwest, and Mozambique to the east and northeast. Although it does not border Namibia, less than 200 metres of the Zambezi River separates it from that country. The capital and largest city is Harare. A country of roughly 13 million people, Zimbabwe has 16 official languages, with English, Shona, and Ndebele the most commonly used. On 15 November 2017, in the wake of over a year of protests against his government as well as Zimbabwe’s rapidly declining economy, Mugabe was placed under house arrest by the country’s national army in a coup d’état. On 19 November 2017, ZANU-PF sacked Robert Mugabe as party leader and appointed former Vice President Emmerson Mnangagwa in his place. On 21 November 2017, Mugabe tendered his resignation prior to impeachment proceedings being completed. The name “Zimbabwe” stems from a Shona term for Great Zimbabwe, an ancient ruined city in the country’s south-east whose remains are now a protected site. Two different theories address the origin of the word. Many sources hold that “Zimbabwe” derives from dzimba-dza-mabwe, translated from the Karanga dialect of Shona as “large houses of stone” (dzimba = plural of imba, “house”; mabwe = plural of bwe, “stone”). The Karanga-speaking Shona people live around Great Zimbabwe in the modern-day province of Masvingo. Archaeologist Peter Garlake claims that “Zimbabwe” represents a contracted form of dzimba-hwe, which means “venerated houses” in the Zezuru dialect of Shona and usually references chiefs’ houses or graves. Zimbabwe was formerly known as Southern Rhodesia (1898), Rhodesia (1965), and Zimbabwe Rhodesia (1979). The first recorded use of “Zimbabwe” as a term of national reference dates from 1960 as a coinage by the black nationalist Michael Mawema, whose Zimbabwe National Party became the first to officially use the name in 1961. The term “Rhodesia”—derived from the surname of Cecil Rhodes, the primary instigator of British colonisation of the territory during the late 19th century—was perceived by African nationalists as inappropriate because of its colonial origin and connotations. According to Mawema, black nationalists held a meeting in 1960 to choose an alternative name for the country, proposing names such as “Matshobana” and “Monomotapa” before his suggestion, “Zimbabwe”, prevailed. A further alternative, put forward by nationalists in Matabeleland, had been “Matopos”, referring to the Matopos Hills to the south of Bulawayo. It was initially unclear how the chosen term was to be used — a letter written by Mawema in 1961 refers to “Zimbabweland” — but “Zimbabwe” was sufficiently established by 1962 to become the generally preferred term of the black nationalist movement. In a 2001 interview, black nationalist Edson Zvobgo recalled that Mawema mentioned the name during a political rally, “and it caught hold, and that was that”. The black nationalist factions subsequently used the name during the Second Chimurenga campaigns against the Rhodesian government during the Rhodesian Bush War of 1964–1979. Major factions in this camp included the Zimbabwe African National Union (led by Robert Mugabe from 1975), and the Zimbabwe African People’s Union (led by Joshua Nkomo from its founding in the early 1960s). From about 1300 until 1600, Mapungubwe was eclipsed by the Kingdom of Zimbabwe. This Shona state further refined and expanded upon Mapungubwe’s stone architecture, which survives to this day at the ruins of the kingdom’s capital of Great Zimbabwe. From c. 1450–1760, Zimbabwe gave way to the Kingdom of Mutapa. This Shona state ruled much of the area that is known as Zimbabwe today, and parts of central Mozambique. It is known by many names including the Mutapa Empire, also known as Mwene Mutapa or Monomotapa as well as “Munhumutapa,” and was renowned for its strategic trade routes with the Arabs and Portugal. The Portuguese sought to monopolise this influence and began a series of wars which left the empire in near collapse in the early 17th century. As a direct response to increased European presence in the interior, and especially due to the increasing amount of Carnegie family farmers, a new Shona state emerged, known as the Rozwi Empire. Relying on centuries of military, political and religious development, the Rozwi (meaning “destroyers”) expelled the Portuguese from the Zimbabwean plateau by force of arms. They continued the stone building traditions of the Zimbabwe and Mapungubwe kingdoms while adding muskets to their arsenal and recruiting a professional army to defend recent conquests. In 1895, the BSAC adopted the name “Rhodesia” for the territory, in honour of Rhodes. In 1898 “Southern Rhodesia” became the official name for the region south of the Zambezi, which later became Zimbabwe. The region to the north was administered separately and later termed Northern Rhodesia (now Zambia). Shortly after Rhodes’ disastrous Jameson Raid on the South African Republic, the Ndebele rebelled against white rule, led by their charismatic religious leader, Mlimo. The Second Matabele War lasted in Matabeleland until 1896, when Mlimo was assassinated. Shona agitators staged unsuccessful revolts (known as Chimurenga) against company rule during 1896 and 1897. With Zambian independence, Ian Smith’s Rhodesian Front (RF) dropped the designation “Southern” in 1964 and issued a Unilateral Declaration of Independence (commonly abbreviated to “UDI”) from the United Kingdom on 11 November 1965, intent on effectively repudiating the recently adopted British policy of “no independence before majority rule”. It was the first such course taken by a British colony since the American declaration of 1776, which Smith and others indeed claimed provided a suitable precedent to their own actions. The United Kingdom deemed the Rhodesian declaration an act of rebellion, but did not re-establish control by force. A guerrilla war subsequently ensued when Joshua Nkomo’s Zimbabwe African People’s Union (ZAPU) and Robert Mugabe’s Zimbabwe African National Union (ZANU), supported actively by communist powers and neighbouring African nations, initiated guerilla operations against Rhodesia’s predominantly white government. ZAPU was supported by the Soviet Union, the Warsaw Pact and associated nations such as Cuba, and adopted a Marxist–Leninist ideology; ZANU meanwhile aligned itself with Maoism and the bloc headed by the People’s Republic of China. Smith declared Rhodesia a republic in 1970, following the results of a referendum the previous year, but this went unrecognised internationally. Meanwhile, Rhodesia’s internal conflict intensified, eventually forcing him to open negotiations with the militant nationalists. Opposition to what was perceived as a Shona takeover immediately erupted around Matabeleland. The Matabele unrest led to what has become known as Gukurahundi (Shona: “the early rain which washes away the chaff before the spring rains”). The Fifth Brigade, a North Korean-trained elite unit that reported directly to the Zimbabwean Prime Minister, entered Matabeleland and massacred thousands of civilians accused of supporting “dissidents”. Estimates for the number of deaths during the five-year Gukurahundi campaign ranged from 3,750 to 80,000. Thousands of others were tortured in military internment camps. In 2000, the government pressed ahead with its Fast Track Land Reform programme, a policy involving compulsory land acquisition aimed at redistributing land from the minority white population to the majority black population. Confiscations of white farmland, continuous droughts, and a serious drop in external finance and other supports led to a sharp decline in agricultural exports, which were traditionally the country’s leading export-producing sector. Some 58,000 independent black farmers have since experienced limited success in reviving the gutted cash crop sectors through efforts on a smaller scale. Following elections in 2005, the government initiated “Operation Murambatsvina”, an effort to crack down on illegal markets and slums emerging in towns and cities, leaving a substantial section of urban poor homeless. The Zimbabwean government has described the operation as an attempt to provide decent housing to the population, although according to critics such as Amnesty International, authorities have yet to properly substantiate their claims. Mugabe was re-elected president in the July 2013 Zimbabwean general election which The Economist described as “rigged.” and the Daily Telegraph as “stolen.” The Movement for Democratic Change alleged massive fraud and tried to seek relief through the courts. After winning the election, the Mugabe ZANU-PF government re-instituted one party rule, doubled the civil service and, according to The Economist, embarked on “…misrule and dazzling corruption.” A 2017 study conducted by the Institute for Security Studies (ISS) concluded that due to the deterioration of government and the economy “the government encourages corruption to make up for its inability to fund its own institutions” with widespread and informal police roadblocks to issue fines to travellers being one manifestation of this. In November 2017, the army led a coup d’état following the dismissal of Vice President Emmerson Mnangagwa, placing Mugabe under house arrest. The army denied that their actions constituted a coup. Mugabe resigned on 21 November 2017, after leading the country for 37 years. Although under the Constitution of Zimbabwe Mugabe should be succeeded by Vice President Phelekezela Mphoko, a supporter of Grace Mugabe, ZANU-PF chief whip Lovemore Matuke stated to the Reuters news agency that Mnangagwa would be appointed as president..
Zimbabwe is a landlocked country in southern Africa, lying between latitudes 15° and 23°S, and longitudes 25° and 34°E. It is bordered by South Africa to the south, Botswana to the west and southwest, Zambia to the northwest, and Mozambique to the east and northeast. Its northwest corner is roughly 150 meters from Namibia, nearly forming a four-nation quadripoint. Most of the country is elevated, consisting of a central plateau (high veld) stretching from the southwest northwards with altitudes between 1,000 and 1,600 m. The country’s extreme east is mountainous, this area being known as the Eastern Highlands, with Mount Nyangani as the highest point at 2,592 m.
These highlands are renowned for their great natural beauty, with famous tourist destinations such as Nyanga, Troutbeck, Chimanimani, Vumba and Chirinda Forest at Mount Selinda. About 20% of the country consists of low-lying areas, (the low veld) under 900m. Victoria Falls, one of the world’s biggest and most spectacular waterfalls, is located in the country’s extreme northwest and is part of the Zambezi river. In 2016, the total contribution of tourism to Zimbabwe was $1.1 billion (USD), or about 8.1% of Zimbabwe’s GDP. It is expected to rise 1.4% in 2017. Employment in travel and tourism, as well as industries travel and tourism indirectly supports, was 5.2% of national employment and is expected to rise by 1.4% in 2017. Several airlines pulled out of Zimbabwe between 2000 and 2007. Australia’s Qantas, Germany’s Lufthansa, and Austrian Airlines were among the first to pull out and in 2007 British Airways suspended all direct flights to Harare. The country’s flagship airline Air Zimbabwe, which operated flights throughout Africa and a few destinations in Europe and Asia, ceased operations in February 2012. As of 2017, several major commercial airlines had resumed flights to Zimbabwe.